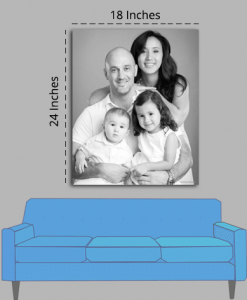 Get any Photo or Text printed on a Portrait Orientation Canvas. 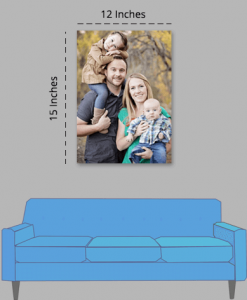 This is the perfect canvas for Self Portraits, Full Length Pictures, Selfies and any other pictures where the height exceeds the width of the image to be printed. 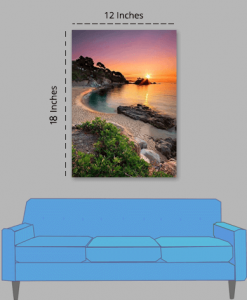 Decorate your place with a photo printed perfectly customizable canvas now! The Portrait Image Printed Canvas is available in Multiple Sizes of 12″x15″, 12″x18″, 16″x20″, 18″x24″, 20″x30″ (All Sizes are in Inches). You can purchase and customize the size of the canvas online as per your requirements. Your Portrait Canvas can be designed by you within a few minutes by using our Designing Tool on the Website. Now you can buy custom photo printed canvases online from the comfort of your homes. Our Canvas Offerings provide the best options to Decorate your Homes or to Gift to your loved ones with the memories printed in High Definition color quality. This makes it the perfect choice for Gifting or Decorating your residence/office.